This is the 2015 review crew. View the current year (2019) review crew here. by dubstyle_2k (Newbie Review Crew Member) after attending on Saturday, October 24, 2015 at about 9 p.m. Loosely playing on the "Hills Have Eyes" film theme, the Hill Has Eyes spins a tale of similar ghouls, but this time it's trailer park freaks and backwoods creeps who are stalking your every move. HHE boasts an impressive 5 attractions for the price of 1, sounds like the best deal I've come across in my journeys! HHE Does have ALL who attend sign a waiver, more on that later. HHE is yet another haunt that I have never attended, I was very excited to get my journey started. I made my first mistake by arriving around 9:00pm... My buddy had dinner plans, what can you do? I was routed to overflow parking, far from the haunt, it was an uphill walk, then down a dirt road. Point is, if you learn anything from me, GET THERE EARLY! This place get busy! After meeting up with my friend, we found the (heated!) ticket booth and preceded to wait in a very long line to buy tickets. A bunch of clipboards started circulating with wavers, but the man in front of me told me I didn't have to sign it because it said for those under 18. Okay, cool! We waited a bit more and made it almost to the front of the line and a gentleman handed us the same clipboard, turns out we did have to sign the waiver, they were just out of the adult waivers. So, after holding up the line a bit so I could sign the waiver that I could have signed 30 minutes earlier if someone had explained to me what was going on, we made our way to the ticket booth and decided to purchase VIP tickets. If it took that long to just buy tickets, how long would it take to get in each haunt? It was only a $10 difference, totally worth it! Skip all of the lines, we got right in! ***One quick thing, if you're worried about signing the waiver, I was never put in danger, hurt, the only time I was touched was when an actor let's say, caressed my beard (weird right? ), there were these prickly things that hung down at one point that we couldn't tell if they were pricking us or lightly zapping us. With that being said, there is a bit of foul language, so that might be the basis for the waver, I'm not sure, probably just a liability thing, because there's a lot of terrain you walk through. ***A few notes on the waiting area: If I weren't there to review HHE I would have loved this waiting area! Full bar, although that could be a REAL problem if you have no control considering $3 beers are pretty cheap for an event like this. There was also a DJ laying it down, having contests and giving away stuff. Now, I don't know how they roll in on most nights, but we almost walked out immediately because within 3 minutes of walking in he played Crazy B**** by Buckcherry. I don't need that in my life ever again, and it's still stuck there! YUCK! ANYWAYS, on to my review! Again let me reiterate, we got the VIP passes, and we didn't regret it one bit! We were able to bypass all those waiting in the waiting area, and the people waiting in the line for the first haunt, Hooded. When you get to the front of the line you are instructed to grab a black hood, from there a man leads you through a door. You will follow a path until you reach what appears to be a soldier holding you up at gunpoint. This is where you put your hood on, now you can't see anything! You are instructed to reach for a rope that is to guide you along the path, that is the only way you can find your way. You MAY NOT lift the mask! FYI, the mask is very dark, very disorienting, and kind of hot! This was unlike anything I've ever experienced in a haunt! There wasn't too much going on here other than it being dark and you had to walk kind of slow. The path was relatively straight and would turn once in a while. It would have been nice if there were more things to startle you, I mean I was expecting something, I was blind to the world, I was on high alert. The soldier plays it well, and gave me a jab or two for having plugs in my ears! After a short stroll through the woods, Hooded is done. It was a fun start to the HHE experience! On to the next haunt, Failed Escape. We entered our VIP line but were happy to wait a few minutes because this this line was one of the only lines to offer entertainment in the form of a very loud, very charismatic clown. The clown did a great job playing to the crowd, and when he noticed that I was laughing, he asked that I was laughing at, and he called me 4-eyes! I love it! Okay, so I'm just going to say that the next two haunts were unfortunately very similar. They start out very different, but both end up about the same. This makes reviewing these two more difficult. 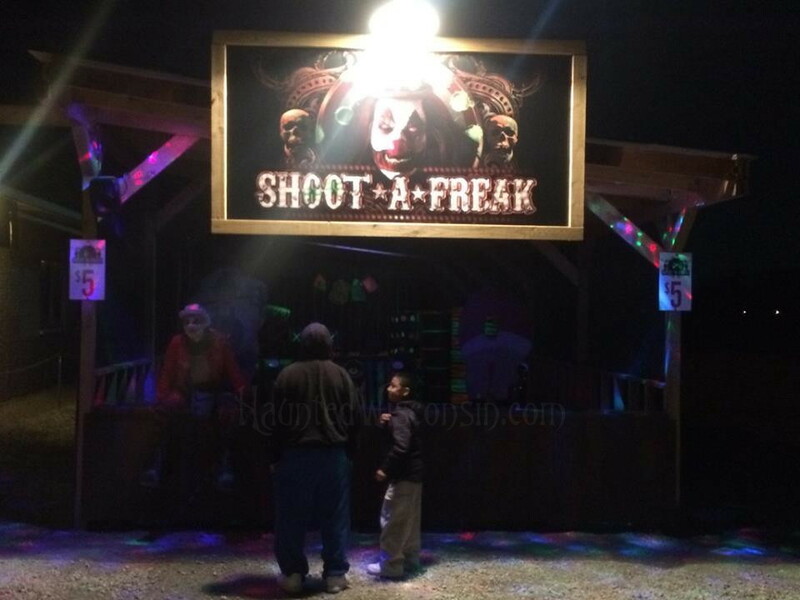 This haunt takes you through a junk yard with some freaks leaping from car to car, then you'll take a trip through the back woods where you'll meet some hillbillies who won't take kindly to your kind trespassing on their property, if you catch my drift. The best part of Failed Escape was by far the actor who recognized my friend and called him out! Nothing like having a backwoods hillbilly knowing your buddies name! After that, the mad men in the woods came out, this was an over used theme, but it's an easy go to in an outdoor, heavily wooded haunt. Now we were on to the next haunt. Hunger Hollow was the third of the five advertised attractions at HHE. The theme started out centered around a butchers shop. Hanging body parts and guts everywhere! As we made our way through the woods again, a group caught up to us. This group had three very hyper teenagers in it. Not HHE's fault, but I wish they would have spaced us out a little more so they wouldn't have caught up with us so quickly, and unfortunately, I was at the end at this point so I had to hear their goofiness, and I had to keep getting bumped into. Not that big of a deal, just my own pet peeves. After going through another section and more woods you'll happen upon a facade. Here they're are running a wicked church service! Pretty cool, and this split us up from the group that caught up to us, even better! They then send you off to the next section of HHE, the Scare Lift! The Scare Lift is a ski lift that will take you back to the top of the hill for the final attraction. There were two clown like fellas manning the lift when we went, they seemed ready to entertain, but just as they were going to do their thing, the teenagers showed up and started asking silly questions, and it became about them and not about the show. So we get on the Scare Lift, and let me tell you, they really dropped the ball with this one. It's really just a ski lift with circus music playing. Now you may be asking me "Pete, what could they possibly do to make it more than that?" Well, I would have had actors riding on random carts, squirting people with water, or silly string, or something. It was just a plain old ski lift ride, kind of boring. The lift leads you to the fifth and final attraction, Carnivore. Carnivore was one of my favorite parts of HHE because it was completely different from the rest of the haunt. Though it's relatively short, it's very fun. You'll experience a carnival style maze, very tight squeeze tunnels, and a spinning vortex, which leads to the climax, a side show featuring a human puppet show! I won't say anymore! You must witness it for yourself! Hill Has Eyes is definitely the biggest haunt I've been to. Though I focused on the fact that they relied heavily on the mad man in the woods angle a lot, they do mix up the themes more than enough to call this haunt original. The bottom line... was this haunt the scariest I've been to? No, but the fun factor is way up there. You will jump, then you will laugh about it after, at least that's how we were. It was a fun adventure. Was it worth the money? That's up for debate, it's an expensive haunt, but like I said, it's the longest haunt I've been to. Coming off of the interstate, there was a sign pointing me down the road I was supposed to take. There is parking control to help with the multiple parking lots (it gets full). The wait area is awesome. It is heated, which is a plus, also if you so desire, there is a full liquor bar, and a DJ. There were no actors walking the area, but it was fun none the less. The actors were okay. The areas where the themes were prevalent, the actors were awesome, but the random actors were just so-so; you could tell those actors were just bit part players. It was an outdoor haunt, the sets were okay. Nothing too fancy. With the VIP pass we were in and out in 45 minutes, so expect to be in there about an hour and a half if you don't buy the VIP ticket, I would guess. Crowd control was excellent! There wasn't any issues, and like I stated above, they were serving cheap beer and alcohol! Hooded, though it wasn't scary, and it could have used more jumps, I've never experienced anything like being blindfolded in a haunt. I liked it! Though a little pricy, and not the scariest haunt, Hill Has Eyes is definitely bang for your buck. It's the biggest haunt I've EVER been too. It's packed with fun! If you're looking for an amusing, exciting evening, this might be your place! 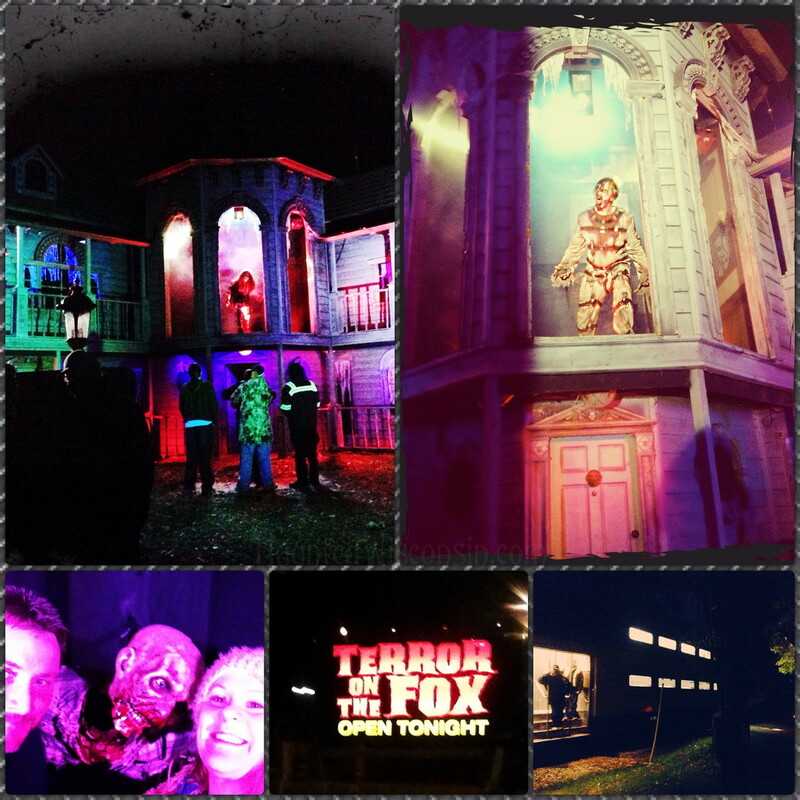 by dubstyle_2k (Newbie Review Crew Member) after attending on Saturday, October 17, 2015 at about 8:30 p.m.
Back for it's seventh season, Racine's Factory of Fear looks to scare you with some old tricks, and a few new ones as well! A century ago this factory was thriving, now nothing is left but the souls who roam the halls. Also, if that's not enough, new in 2015, Zombie Massacre has been added to the fun! You'll have to defend your house from blood thirsty zombies in this interactive laser tag competition. 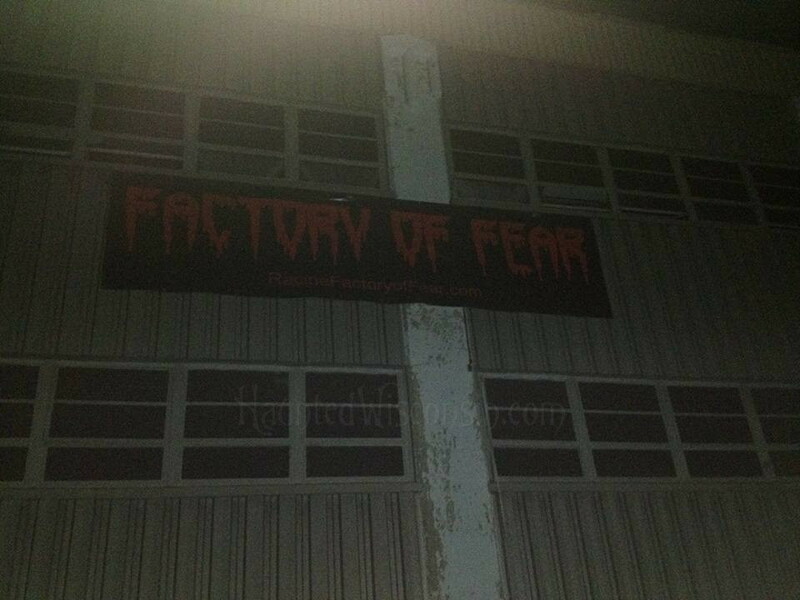 Let me start off my review by saying that I was very excited to review Factory of Fear, this was my first visit to the Factory, so I didn't know what to expect! We were first lead to a stairway where we were given some instructions, our group of 9 was then split into two separate teams and we were lead up the stairs where we entered two different wooden shacks. Zombie Massacre Laser Tag had begun! The object of the game was to not let the attacking zombies knock off the boards from the windows of your house, the team with the lowest score at the end of the game wins. Each team member gets a laser gun, and you defend your house by shooting the zombies in the head; they attack at random, sometimes in hoards. Zombie Massacre was a blast, and it was one of my favorite ways to begin a haunt in quite some time. We were against a family with a mother, father, and three children, two of which were under 13... Our team of four adults lost the game easily! Pretty embarrassing! After the game we were pulled into a room and huddled all together so Mrs. Bones, and puppeted skeleton could explain a little of the back story of the Factory of Fear. Next they split us up into our groups that we were in for laser tag, and sent us through two separate doors. We were off to haunt number one! The first haunt you go through is called Devil's Nightmare, and I can attest that that name is fairly accurate, well, at least the beginning was for us! The first section was the longest, most grueling section of a haunt I think I've ever gone through! With that being said, I applaud them for it! It was so simple, yet so tedious to get though. It WAS like a Devil's Nightmare, great job Factory staff! Devil's Nightmare is an actor heavy, theme in every room, haunt that leads you though some dark hallways and dead ends. This haunt is your traditional gore-fest, with misdirection, loud noises, and great acting, In all, Devil's Nightmare is just what you're looking for in a haunt, it covers all of the bases. After we exited Devil's Nightmare we again met up with the other group from laser tag. A staff member held them up a bit, sent that group on, and then had us wait a while before sending us along, into the second and final haunt, Blind Madness. Blind Madness wasn't my favorite haunt of all time, it is short and lacks too much interaction, but I guess that's what you are going to get when you enter a haunt called "Blind" Madness, right?! But what it lacks in duration, it makes up in sensory deprivation and overload! If anyone has read a review of mine, you know I LOVE that! Any time you mess with my senses I am all in! Blind Madness is a nice little throw in to a pretty good attraction, which makes Factory of fear a well rounded haunt. If you're not from the area, make sure you have GPS on, it's tricky to find! The sign was pretty dimly lit, and if you weren't looking for it, I'm not sure you would spot it. The waiting area is indoors, which was nice. There was ZERO organization to it. When we got our tickets we had to give them my cell phone number, I got a text thanking me for my purchase, and the cashier told me when I got the second text that I should tell the security guard that I received a text... I didn't realize that it would take an hour and a half for the second text to come. It was just a bunch of people hanging out in a room, with no directions, for hours., waiting for texts. There were two actors in the waiting area roaming around that were VERY entertaining. One actor had an alien baby puppet that would awaken and scream, and the other had a possessed demon woman puppet attached to him that would scream. These men were great! The actors in the haunts are are great. 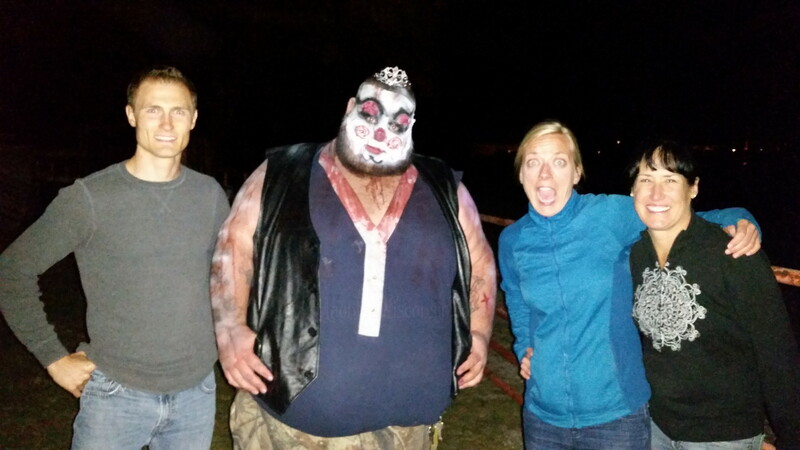 From the zombies in the laser tag which really hammed it up, to the giant creature on stilts, there are some great ones at Factory of Fear! Like I mentioned above, the waiting area is a joke. No structure, nobody really knows what's going on. Unless you can squeeze your way to the front and ask one of the security guards, you're going to be left in the dark. Bad set up. A man in black popping out startled my girlfriend quite a bit! It's something I was expecting, but she wasn't!!! Factory of Fear is back for year seven, and this year it's added laser tag to the mix! Factory of Fear's two haunts Devil's Nightmare and Blind Madness are two typical walkthrough style haunts. What sets Factory of Fear apart from other haunts is Zombie Massacre, the interactive laser tag! This got our night off on the right foot, and made it totally worth it! If you venture out to Factory of Fear, make sure you spend the extra $10 and play Zombie Massacre, it's totally worth it! by wm (Newbie Review Crew Member) after attending on Saturday, October 17, 2015 at about 9:30 p.m.
Looks can be deceiving! Driving up to Wisconsin Scaryland, it just looked like any other large building. But inside this average looking dwelling was another story! The line for Wisconsin Scaryland was impressive! It’s clear that this is a very popular attraction, the wait was close to two hours! There are two separate wait lines: one outside and one inside. The smoke alarm kept going off as they were using a fog machine in the inside wait area. At first I thought that was just another sound effect until I saw a worker keep fanning the air by the alarm to make it stop. Although it’s very expensive, you might want to consider the 'Jump The Line' ticket. Especially on a cold night where you're waiting over an hour! Your journey starts in an elevator where they lay out the rules. It's there that you learn that you cannot touch the actors, but they CAN touch you! It's good that they state this right up front so visitors are not too freaked out when it happens. Then you ascend to the "13th" floor and to the horror that awaits you. There are three different themes in Wisconsin Scaryland: the Westport Penitentiary, Toxic, and the Carnevil Big Chop Circus. While some haunts would make these three separate attractions, here they flow from one theme into the next. There were so many great staged scenes: The cemetery, the circus, the trashed bathroom (SO gross), the nursery, the dentist office... every room was done very well! They had them all dimly lit to perfection. Unfortunately not all the rooms had actors in them, but everything was great to look at. 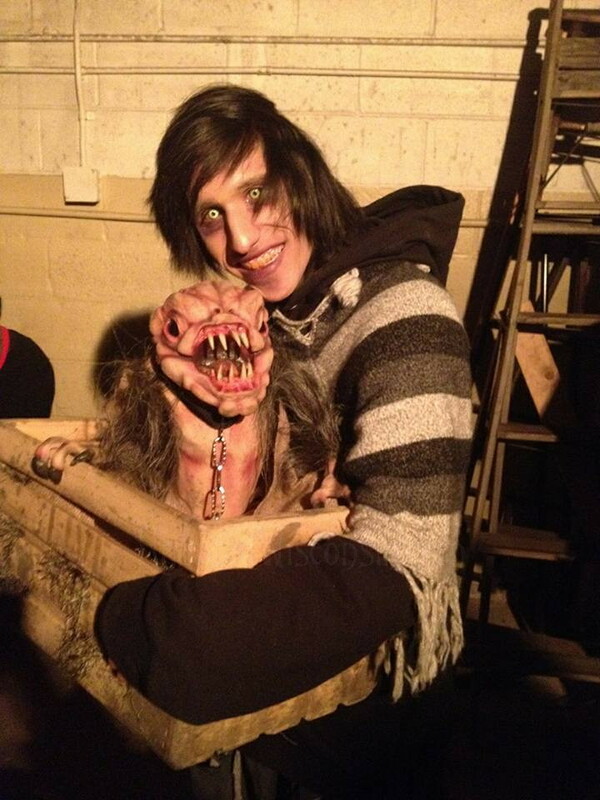 As mentioned above, one thing that makes this haunt unique is that they the actors can touch you. This isn’t over-done, but just enough to freak you out! There were a few times where someone grabbed or lightly touched me. Their timing was great! The haunt seemed to end abruptly. I thought we were walking into the next scene and it really was the exit. I didn't want it to end!!! In talking with other visitors, everyone seemed to really enjoy themselves. A tip that I didn't find out until after my visit: Purchase your ticket online for a nice discount! It's pretty easy to find Wisconsin Scaryland, and you'll definitely see the crowd of people waiting in line. There were a few actors walking around as you waited in line. Nothing scary, but definitely entertaining! It was a little confusing where you needed to purchase your tickets. Most all of the actors did a great job and really went all out. Even the nurses that take your money were great! All the scenes and props in Wisconsin Scaryland are top notch. You would expect them to be, considering that Halloween FX Props designed it! It took approximately 20 minutes to make our way through all three themes. It was a very busy night, and there were several times we bumped into other groups. I have to say that the one thing that I remember most was walking through a large public bathroom. The janitor was hilarious! Long lines, but well worth the wait! 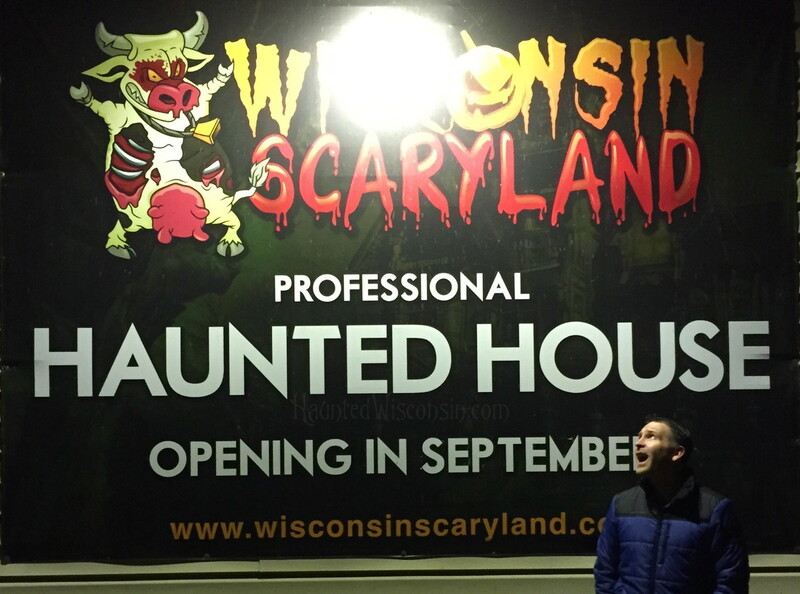 All in all, Wisconsin Scaryland is a very professional and well run haunt! by wm (Newbie Review Crew Member) after attending on Friday, October 16, 2015 at about 11 p.m.
For years I’ve heard about the Haunted Barn. I always hoped that one day I would be able to take a road trip and visit this well run haunt. When the Haunted Barn went away last year, I was extremely disappointed. Another great haunt that I would never be able to attend. But earlier this year I hear that they’re back for 2015!!! I was determined that I wasn’t going to miss out on attending this year. I have to start this review out by saying that the staff was GREAT! This was the second haunt I attended on the same night, and the first haunt ran longer than expected. When my GPS took me to the wrong place (twice), I called their number to get their correct location. When they state that they never turn someone away, THEY MEAN IT. Although we were late in arriving, they rolled out the red carpet for us. 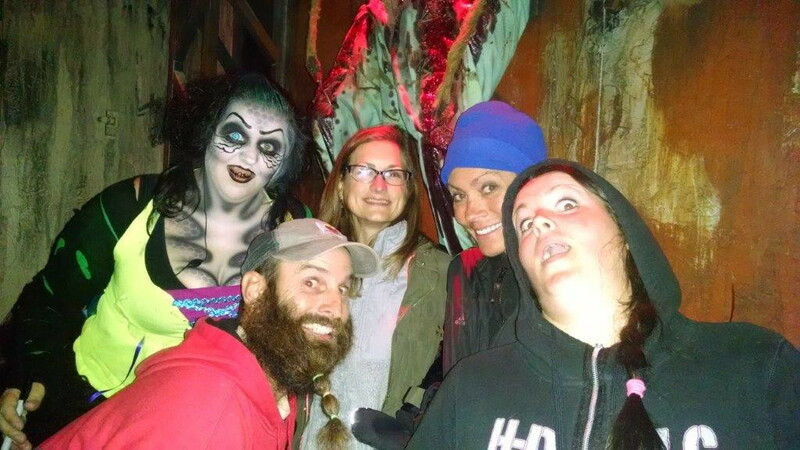 (Not knowing I was reviewing their haunt for Haunted Wisconsin) From those at the ticket booth, to the food booth, to all the actors in the haunt itself: definitely a CLASS ACT! They take pride in what they do, and they do it well. It's haunts like the Haunted Barn that do it for the love of Halloween and giving a good scare! I unfortunately didn't get any pictures of the haunt or it's actors due to not wanting to keep them any longer than needed. I hope that they continue to stay around for a long time to come, and I mean that sincerely. Thank you! The location of the Haunted Barn is great. There’s not much around it but its also not too far out of town where you're in for a long drive. The grounds is setup very well and visually the barn is impressive when you drive up. First impressions set the stage to your experience... and my first impression, both by the staff and the look of the barn, was telling me I was in for a treat! Considering there is limited space in the barn, they do a great job of making the most of their square footage! It seemed that every time we turned a corner there was a scare or surprise waiting for us. The bloody bride got me really good! The fortune teller was very entertaining, repeating several times that I had 'something to hide'. (If she reads this review, this is that something!) The little girl that led us to different areas was humorous and never once dropped character. Just when we thought we were done, there was one last scare that had us running! The scoreboard for those whom either wet their pants or quit the haunt half-way through is a nice touch! I'm so very glad I was finally able to visit the Haunted Barn. One more thing off my bucket list! Here's hoping they continue to provide a quality haunt for years to come. There's something up with both Google maps and iphone maps that kept giving us the wrong address. It's really not hard to find, just take Hwy 51 out of Stoughton. Once you're they're, you'll see it right away! We did not have to wait... they were waiting for US! The waiting area was setup very nice, both outside the barn and right in the main entrance. The actors and staff are really what makes the Haunted Barn a MUST ATTEND. They're not in it to make money, but I do hope they make some! They're timing was perfect, nobody dropped character, and it was literally one scare after the other. The sets are a bit rustic. In my mind there are corporate haunts and there are homegrown haunts. This haunt falls under the homegrown category. It might not be as polished as the haunts with bigger budgets, but they make up for it with creativity and great acting! It took about 15 minutes to go through start to finish. I personally would rather have 15 minutes of non-stop action than a haunt that is super long but light on scares. Kudos! We did not have to deal with any crowd control, until we were bumping into each other at the end as we were running away! In all my years of attending haunts, and there's MANY years, I was very impressed by this entire group and their haunt. They're good people! But don't let that fool you... they're going to scare the crap out of you! by Captn_DeathSchlager (Newbie Review Crew Member) after attending on Friday, October 16, 2015 at about 9 p.m. The 2015 edition of Neenah’s Most Haunted presents a Terror-riffic Tour. Walk through a maze of creative room and hallway layouts, all elaborately detailed with articulately dressed and skillfully positioned ghouls. Be very careful though, an epidemic is ravaging the inhabitants of this haunt turning many of them into Zombi-riffic creatures of the night looking for more victims…will you be infected as well? While this isn’t the scariest haunt I’ve visited it most certainly offers a ghoulishly great time…especially for younger haunt goers. Despite the kid appropriate scares here adults will definitely enjoy the clever room layouts and polished performances of the ghouls as well as the maze that awaits. While dark and potentially frustrating the maze provides a uniquely chilling experience. Neenah’s Most Haunted is in its 30th year and the 6th year of the last 7 that I’ve visit this haunt. Each year I’ve been pleasantly surprised by the improvements and the superb job the young actors do portraying their roles. Fun & Nicely Done! 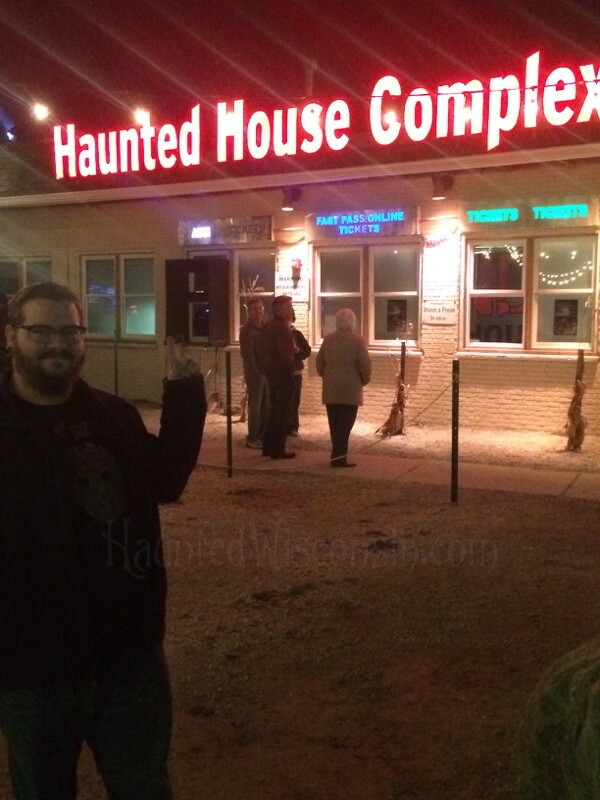 The waiting line was clearly roped off….but there was no line when my group attended this haunt. 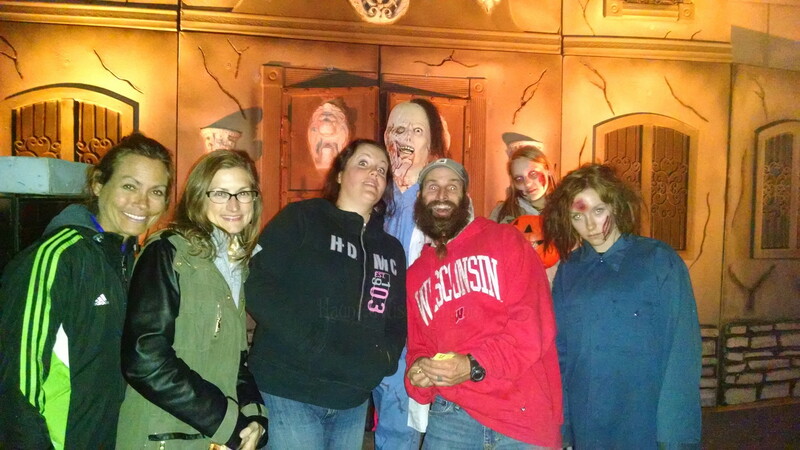 Of all the haunts I’ve toured Neenah’s Most Haunted did the best job of providing a ghoulishly fun time for haunt goers of all ages. While the scares here are definitely kid appropriate, adults will definitely enjoy the clever room layouts and polished performances of the ghouls. 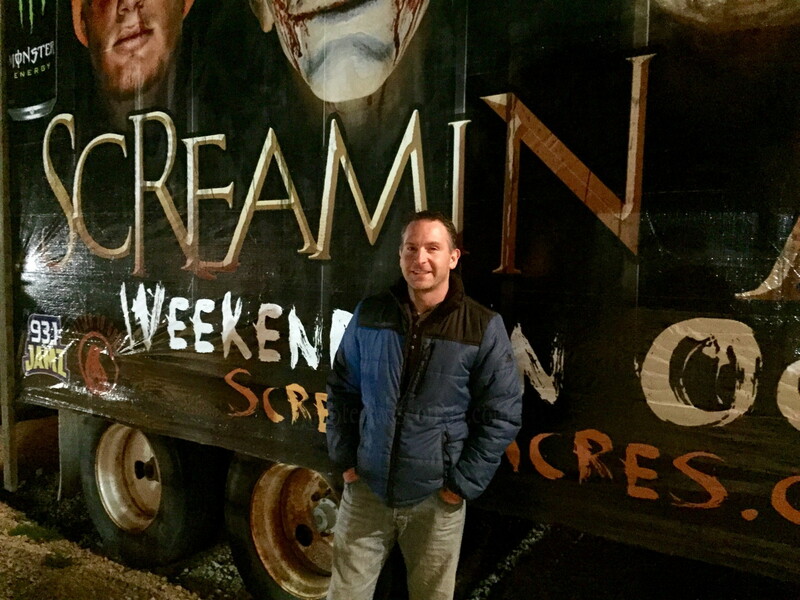 by wm (Newbie Review Crew Member) after attending on Friday, October 16, 2015 at about 9 p.m.
You would think with a name like ‘Screamin Acres’ that this haunt would be huge. Well, you thought right! 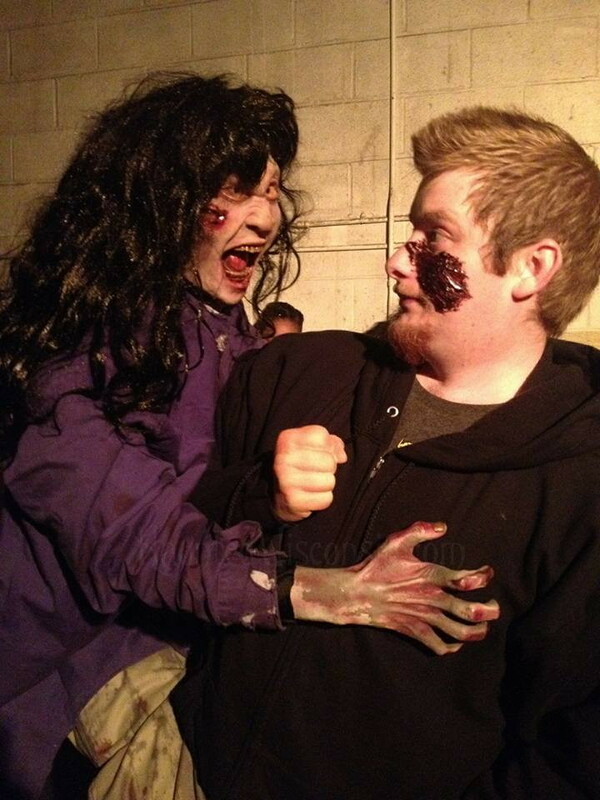 Screamin Acres is one of the biggest haunted attractions around that includes multiple areas. There’s so much ground to cover, at some point I lost track of time! They expect to expand their haunt every year, which is mind-blowing as it’s already huge with multiple themes. While some other haunts will charge you for each theme or attraction, you get everything for one price here. The wait area is very nice and impressive. It’s housed under a big tent, so you are out of the elements on those nights that are cold and nasty. The first thing you notice is the dj spinning the tunes. Not some cd playing on repeat, but an actual dj in a booth! The whole tent is lit up with lasers, which is another nice touch! First up is the Slaughter House. If you’re into gore, then this will be right up your alley with a few scares thrown in. The amount of detail was crazy, those with weak stomachs beware! Then we went through the corn maze which was dark and quiet. Being out in-between the corn stalks at night is creepy! Your mind will start to play tricks on you and you’ll start jumping at things that aren’t even there. Then throw in a few actors to really keep you on your toes! You can never go wrong with a corn maze at night. About halfway through Screamin Acres I realized something was missing. Shhh…. Can you hear that? No, I don’t hear anything! While there was a music playing in the wait area, pretty much 95% of the experience was void of music or pumped in noises. While odd at first, I actually enjoyed that! It was eerie to walk in the cornfield or down a long dark corridor with no music or automated noises. DEAD QUIET, other than some screams heard off in the distance. It made this haunt that much more spooky! Next we entered the Crawl Space. I won’t give too much away, but smells play just as big as a role as what you’re seeing! VERY realistic, but hardly any actors. That leads you to the Last Resort, which is more a traditional style haunt. We were startled a few times in there! Just when we thought it was all done, there was Side Effects. This is a 3D attraction complete with glasses. There was a little bit of everything! Several actors were very funny, while others were down-right scary. Some opportunities for a good scare were lost due to number of staff versus the size of the haunt. That’s really my only complaint. Many rooms looked incredible but there was nobody in them. But with that said, the amount of detail was incredible! It felt like we were walking through a big budget horror movie. On busy nights, the Fast Pass is a good deal for only $10 more. It was very easy to find! My GPS took me right to it and it's very well lit. I was surprised that there wasn't much of a wait to get in for a Friday night. As stated above, the waiting area in impressive! All of the actors did a great job performance wise. All were in character and did a great job. More of these fine actors is what's needed for a haunt of this size. This is where Screamin Acres shines. The scenes are incredible! I can't imagine how much time was put into creating all those great rooms, and there are a ton of them! There are five different parts to this attraction: The Slaughter House took about 20 minutes. The corn maze about another 20 minutes. The Crawl Space took about 10 minutes. The Last Resort took about 15 minutes. Side Effects took about 10 minutes. Everything together lasted approximately 75 minutes. There wasn't much of a crowd when we attended, so we did not bump into anyone during our journey other than the line before the Last Resort. There was a scene in the Crawl Space that combined sound, smell and gory visuals that will haunt me for some time! 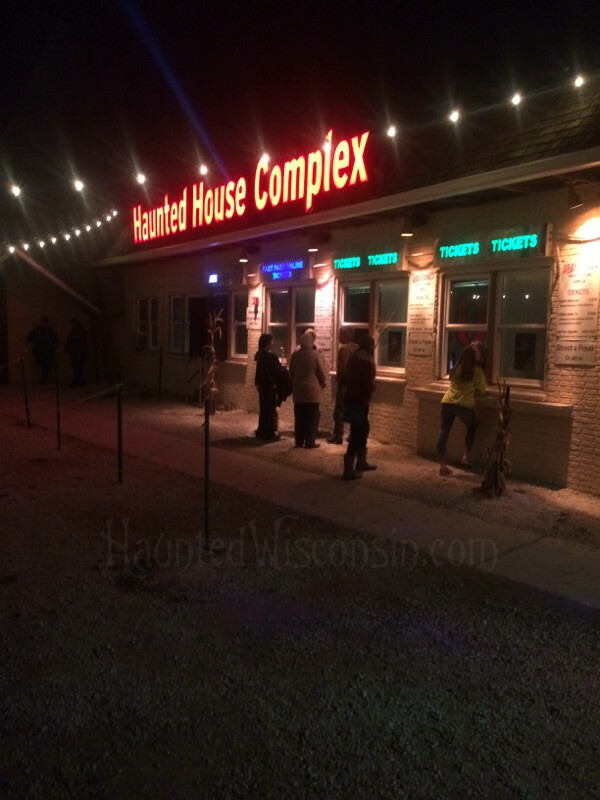 If you’re looking for a fun, large haunt in the Madison area look no further! You really get the maximum ‘bang for your buck’ at Screamin Acres. 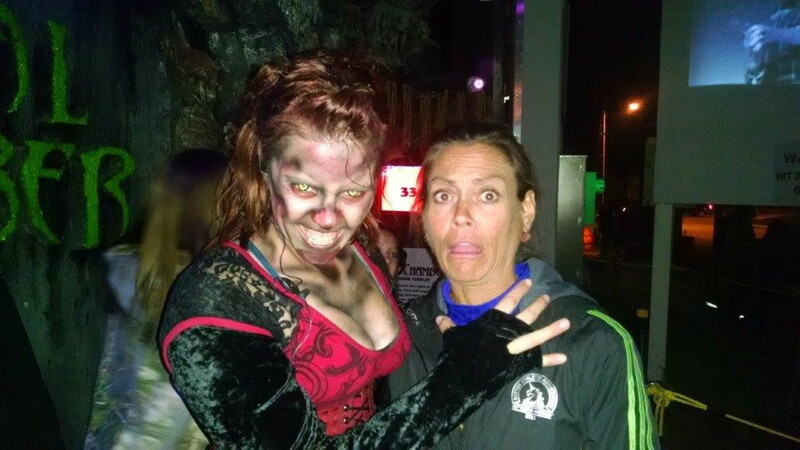 by Captn_DeathSchlager (Newbie Review Crew Member) after attending on Friday, October 9, 2015 at about 8:30 p.m.
Sensationally Scary! Fantastically Frightful!! Prepare yourself to be shocked and awed…regardless of whether you’ve never been to the Burial Chamber complex or you’ve attended toured all 7 reincarnations of this haunt a terrifying tour awaits you! While the sheer size of this haunt may make first timers gasp with nervous anticipation what lurks inside will certainly take everyone’s breath away. 2015 was my 6th visit to Burial Chamber in the past 7 seasons. Amazingly, despite being familiar with the scare tactics employed by the ghouls and demons at Burial Chamber they have always succeeded in making me jump. If you’re concerned about similarities between this year’s tour and prior year’s you’ll be pleased to find several new rooms and creepy encounters to excite your senses…particularly in Insanity. Over the past 7 years as a Review Crew Member I’ve been to many of the haunts in Wisconsin and I’ve yet to find one as massive as Burial Chamber…or as talented at terrorizing you. Of course for all you Haunt Connoisseurs out there I don’t have to tell you that it’s not always the size of the haunt that matters. When it comes to Burial Chamber, not only is this complex well endowed, it employs an amazing arsenal of creeped out corridors, crazy creatures and good ole’ fashioned in your face scares to maximize your ghoulish gratification. Burial Chamber features two indoor haunts (Adrenaline and Insanity) that reside side by side and one (Phobia) that’s outside. The layout of Adrenaline and Insanity are similar in that they are both comprised of a seemingly endless maze of cleverly crafted corridors consisting of a variety of themes. The journey through both Adrenaline and Insanity progresses continuously without stoppages for elaborate skits. Rooms here are more like themed corridors than rooms and your pace through these haunts are determined more by how quickly you walk than it is by the creatures lurking in the shadows. Consistent with prior years, the pace of Adrenaline is fast and furious as the ghouls are unrelenting in their quest to scare each and every visitor regardless of their position within a group. Yes, you read that correctly…you will be terrorized regardless of your position in your group as there is no place to hide from the menacing monsters lurking throughout the haunt. The lighting of Adrenaline is noticeably darker than Insanity but there was always just enough light for you to find your way without the worry of walking into a wall. The maze of dimly lit hallways of Adrenaline did an exceptional job of building my anticipation of the scares that await but unfortunately made it challenging for the true haunt connoisseur in me to appreciate how elaborate the sets and creatures were. Nonetheless, if you’re looking for a good scare to get your heart dancing like Dracula’s Discotheque Adrenaline will get the job done! Insanity on the other hand left little to the imagination. Sets were lit effectively…dim enough to encourage you to keep your scare guard up but light enough so that you could appreciate the amazing attention to detail with the sets and costumed actors. There were fewer creatures lurking in the shadows of Insanity but enough to make you jump occasionally. Gore and special effects were plentiful with several visual abominations that will torment your mind long after your exit. Laser lighting, black lit rooms, a vortex, strobe lights, and trick floor were just a few of the visual stimuli Insanity offered up. Unlike Adrenaline and Insanity, Phobia resides completely outside and features a terrifying tour through the woods along with occasional petrifying passages through eerie dwellings found along the way. Rustling brush and sinister sounds heighten your anticipation of what’s to come as you proceed along a moon lit path. Similar to Adrenaline, the monsters in Phobia were menacing, highly motivated and acrobatic doing an exceptional job of appearing out of nowhere to scare each and every member the tour group regardless of position. Consistent with prior years, I find it challenging to pick a clear-cut favorite out of Burial Chambers 3 haunted attractions. By far Adrenaline was the most terrifying while Insanity offers an amazing visual experience. 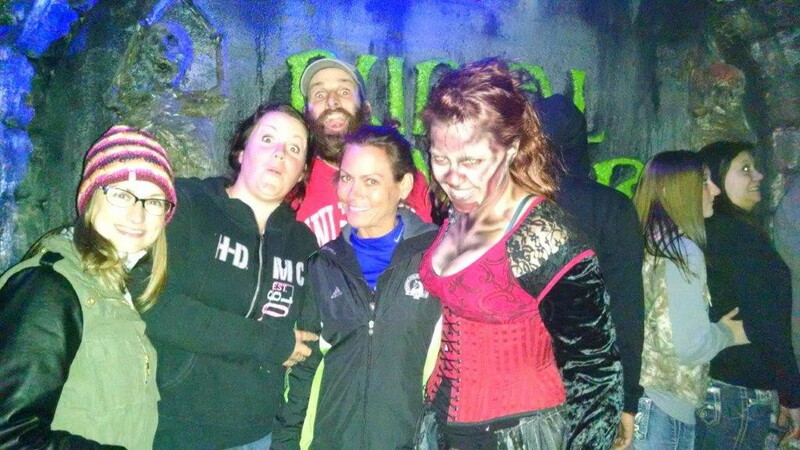 Of the 7 haunted attractions I’ve been to in 2015, Burial Chamber once again has my vote as the scariest most terrifying attraction! Come dressed for the elements as the wait lines for Adrenaline, Insanity and Phobia are all outside. Two large screens outside of Adrenaline and Insanity along with a few costumed actors help to build your anticipation. There's also a snack wagon parked out back to help satisfy your cravings for munchies. If you don’t like long lines and lengthy waits be sure to purchase VIP passes to take advantage of the shorter VIP lines. Burial Chamber consistently, year after year, appears to be the most popular haunted attraction in the state! Brilliant use of shadows and dimly lit hallways/rooms to maximize scare and creep factor. Set designs were very effective in immersing you into the theme of the haunt. Not the most elaborate set designs I've seen but definitely better than the average haunt. Enjoyed some of the unique concepts and special effects. Trick floors, falling ceilings, vibrating walls, tripped out laser lights….there’s a little bit of everything to keep you on your toes. I particularly enjoyed the cleverly laid out mazes in both Adrenaline and Insanity. Waiting lines for both Adrenaline and Insanity were clearly marked off along with the separate VIP lines. Several great scares....if clowns creep you out you’ll really enjoy Insanity! If you’re looking for a totally terrifying experience this Halloween look no further than Burial Chamber. Minute for minute Burial Chamber’s Adrenaline and Insanity haunts provide more scare opportunities than any other haunt I’ve attended. Adrenaline’s scares come early and often while Insanity showcases more gore and visual effects but still provides plenty of scare opportunities. For those who thirst for more thrills Phobia offers even more horrific haunted mayhem. by Captn_DeathSchlager (Newbie Review Crew Member) after attending on Saturday, October 10, 2015 at about 10 p.m. The Dwelling of Despair Haunted House & accompanying Forest of Fear is a self-guided, interactive ghoulish attraction known for its scaretacular special effects, intense make-up, elaborate decor, skilled actors, unique monsters, unusual themes and chilling detail! To put it simply the Dwelling of Despair & Forest of Fear is the total package - an extremely high quality immersive event that merges SCARY, FUN and COOL into a safe environment. More importantly the Dwelling of Despair is ever changing. Accompanying the new name for this haunt are new effects, scares, characters, story lines and an extended terrifying tour. Rest assured though, this haunt has still retained the same Halloween charm that has brought guests back for the past 30 years! 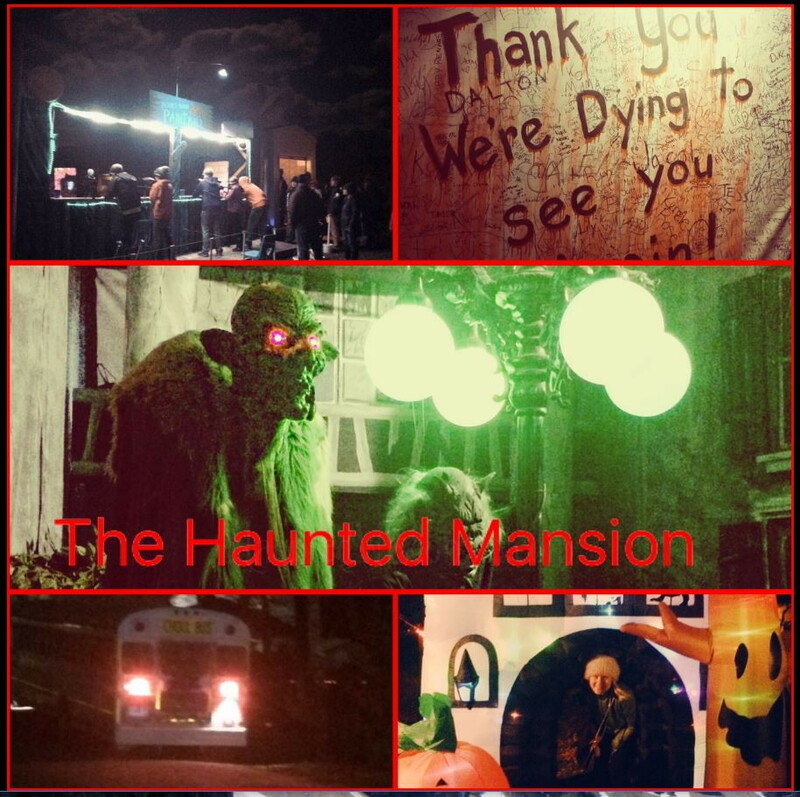 The 2015 edition of this haunt presents two horrifying sections to test your wits and your desire to survive. THE Forrest of Fear kicks off your terrifying tour on a dark and twisted path patrolled by evil spirits and several fiendish ghouls. If you're lucky enough to slip past these gorish guardians the entrance of the 3 story Dwelling of Despair awaits from the 3rd floor balcony. To escape the nightmares found within the unfriendly confines of the Dwelling of Despair you must successfully navigate a maze of uniquely themed rooms and hidden passages through the bowls of the entire house. Along the way you are sure to encounter each and every inhabitant of the house...some fun, some helpful but most of all they are all quite frightful! This haunt offers a wood shack with a concessions stand to comfort you while you anticipate the horror that awaits you. A tented staging area provides shelter from the elements as you undergo last minute preparations before your terrifying tour through the woods. A great mix of adult and young actors delivered very entertaining performances. A few of them were absolutely exceptional at adlibbing and allowed you to playfully interact with them. 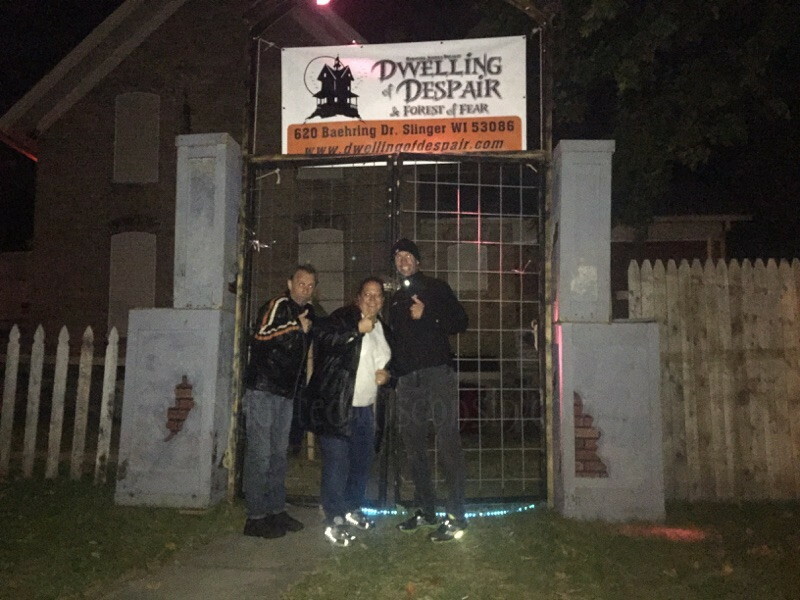 Of the 6 haunts I've toured so far this year the performances at the Dwelling of Despair were by far the best! Less veteran haunt goers looking to get freaked out will not be disappointed. All haunt goers will be certainly be entertained. Some very unique sets and a several outstanding special effects. Several to choose from…. I don’t want to ruin any of the sensational surprises that await but Lorenzo's adlibs were a real treat. by majorXpsycho (Newbie Review Crew Member) after attending on Saturday, October 10, 2015 at about 7 p.m.
Thousands of visitors travel to Northern Wisconsin every year for the breathtaking views of the trees changing colors. However, travel up a desolate road not far from Hwy 41 in Oconto, and you will find something else in the woods that will take your breath away! Located only 20 minutes north of Green Bay, your fears of what lurks in the woods, becomes real at the Trail of Terror, known as the longest haunted woods in Wisconsin. It wasn't until we traveled 2 miles on a small rural road that we saw the sign for the Trail of Terror glowing in the distance. We had not even parked our car, and ghouls were already on us! We found our way to the ticket booth by following the large glowing light of the bonfire. There is one option for purchasing tickets and you are given a glowing necklace (so the ghouls can track you) and a keepsake wristband that states "your tears bring us joy". There is no standing in a long line at this haunt, you can purchase several goodies from hot cocoa to nacho's while you warm yourself by the bonfire. While waiting for your name to be called, ghouls will stalk you and blood curdling screams can be heard coming from deep within the woods. The fear builds while you listen to the victims who have gone before you. Our name was finally called and we were joined with two other small groups along with a few "tour guides". The moment you walk into the woods, the ghouls are are grasping for you and they try to warn you not to continue. Suddenly, a loud "bang" makes everyone jump and seek escape. The lengthy trail is only lit by a few flaming torches along the path, so there is no way to predict where the ghouls are lurking. Around several bends your group is sent without a guide into a horror filled scene. The "minds" behind the Trail of Terror want you to feel frighteningly uncomfortable and they make certain that if the woods alone do not "terrorize" you, one of the many scenes or ghouls will! All of the ghouls were full of blood curdling energy and they will touch you, and I don't just mean a small "tap" on the shoulder. If you think you can hide behind someone and remain safe, you are wrong! At 30 minutes long, you begin to wonder if the horror will ever end. Just when we thought we were safe inside our vehicle, the horror continued! Since there are not multiple attractions at the Trail of Terror, all of the creativity and energy is focused on making the Haunted Woods a true masterpiece. 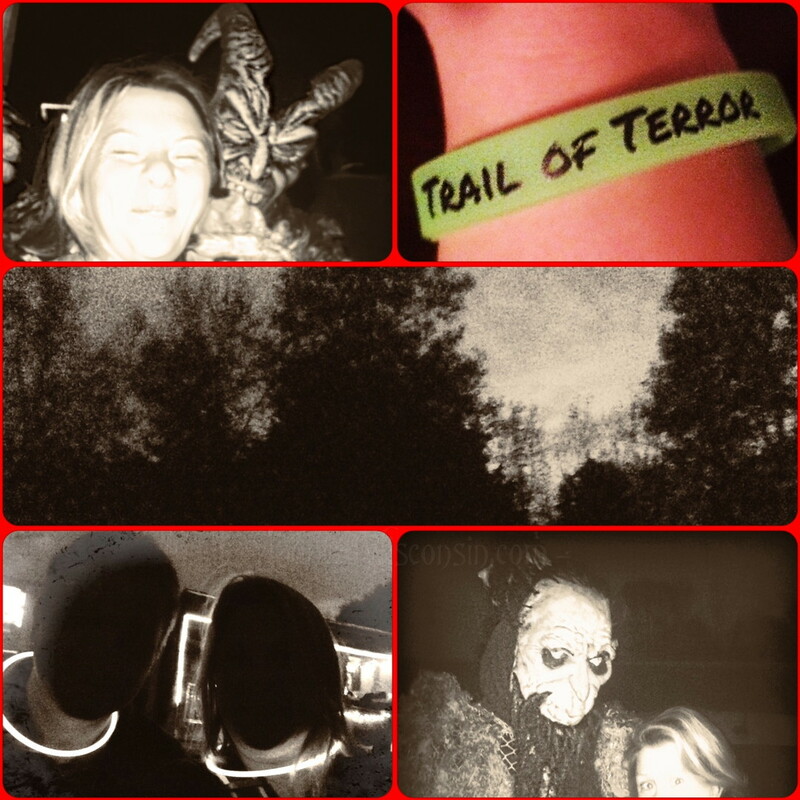 The Trail of Terror is the longest haunted woods in Wisconsin and they specialize in making you scream. The ghouls are "hands on" from the moment you arrive to the second you leave. The length of the Trail of Terror, lack of having to stand in line, delicious treats, frightening setting in the woods, high energy ghouls, and carefully crafted scenes makes this attraction the best haunted woods in Wisconsin! by majorXpsycho (Newbie Review Crew Member) after attending on Sunday, October 4, 2015 at about 8:30 p.m. The Morgue is a 1920's haunted abandoned school house located near the Austin Straubel Airport in Green Bay. This was my first visit to The Morgue which has been at this location for approximately 20 years! It is rare that I am caught "off guard" at any Haunted House, but The Morgue is nothing like any other haunted house I have attended. Once you arrive you purchase a wristband and you are directed to a walk through the woods. The woods was very dark and it was difficult to navigate, but we managed to make our way through. There were no ghouls in the woods, but it helped build up the fear for the main attraction. Once you exit the woods, you first notice a HUGE bonfire with lots of couches and seating area's all around. There was already a sizable group waiting for their numbers to be called in order to enter The Morgue. Everyone that pays admissions receives a wristband with a group number on it, this allows you to relax, purchase food, beverages or just enjoy the bonfire. There are also several ghouls roaming the groups outside, waiting to catch you off guard. I witnessed a young man running for his life and he lost a shoe while trying to escape. The school house was difficult to see, so it isn't until you are inside that you realize you are in a truly paranormal environment. When your number is called, the scares begin! You do not enter the house with other groups, so you do not have to worry about other annoying crowds ruining the fear. Everything inside the haunted house was completely unexpected, starting with the very first "room". I heard someone outside refer to the inside of the haunted house as a "large playground", but I feel that is a strong "understatement". I love haunted houses that rely on real "phobia's" instead of just using "scary animatronnics" and The Morgue has mastered this technique! A bloody moving corpse isn't as scary to me as walls caving in, floors dropping and abandoned school houses. Yes, there is a slide and it is the largest slide I have ever seen at a haunted attraction, but that doesn't even begin to describe the 45 minute long experience I had inside The Morgue. The ghouls did a phenomenal job and you could tell they truly were passionate about making you scream and squirm. 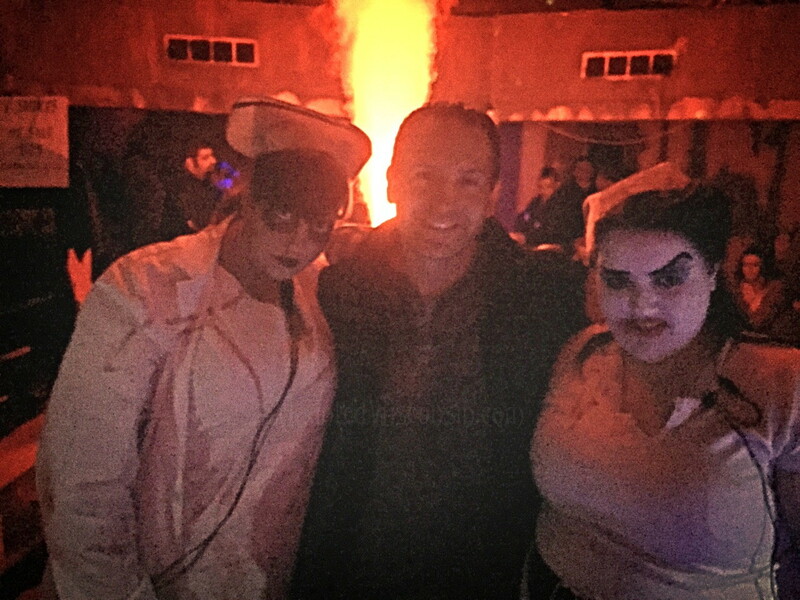 There was very little "down time" aside from the 3 stories that you climb on several occasions throughout the haunt. The engineering and innovation that has gone into this lengthy haunt is clearly the result of a team that understands what really makes people scream. 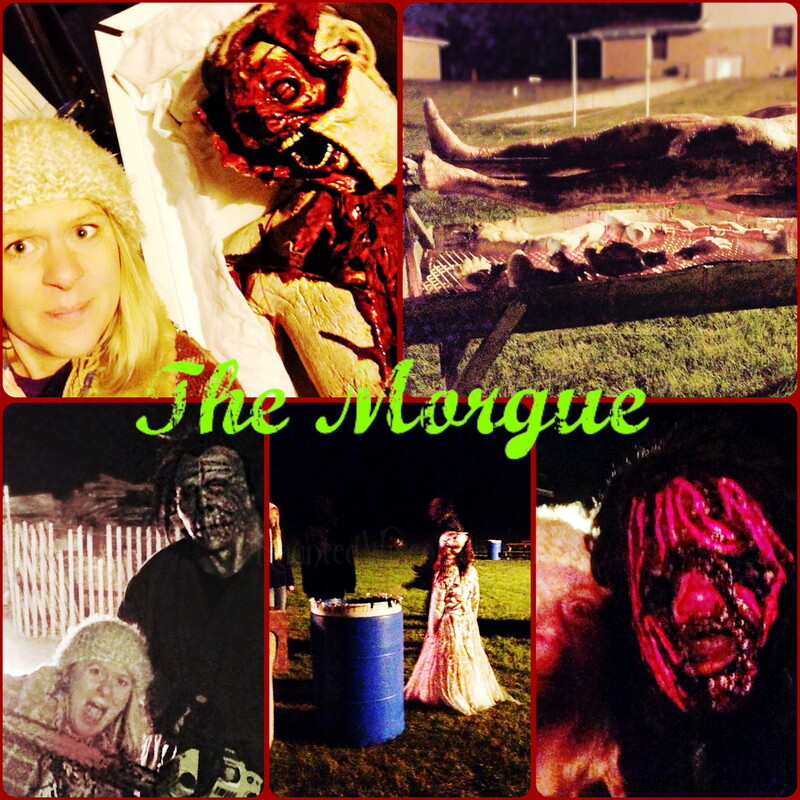 The Morgue is a uniquely terrifying haunted attraction that is located inside of an old 1920's school house. There is no standing in line, so feel free to cuddle up and enjoy good conversation with others around the huge bonfire. We are all afraid of "something" and if you attend the Morgue, be prepared to face that fear! While the slide increases the fun factor, it is just a small part of a much larger frightening experience. This is definitely one of those haunts that everyone should experience! by majorXpsycho (Newbie Review Crew Member) after attending on Saturday, October 3, 2015 at about 7 p.m. Your worst nightmares will become real in Green Bay! No, I am not referring to the Green Bay Packers losing, but rather the terror that awaits you only 5 minutes from Lambeau Field at Terror on the Fox. For 19 years, Terror on the Fox has grown exponentially, adding length, more attractions, increased props and a large collection of souls left behind. Terror on the Fox is located at the National Railroad Museum and during the fall, the real double decker passenger train is transformed into a fog ridden ghost ride that leaves you screaming for escape. When you arrive at Terror on the Fox, the true nature of what is hidden deep in the woods is not apparent and you can only see the glowing red lights of the moving train. We arrived shortly after the sunset in order to avoid any lengthy lines, but due to the popularity of this Haunt, the lines had already begun to grow. Prior to purchasing your tickets, there is plenty of gifts and food for purchase. There are 4 different ticket purchase options ranging from $15 - $35. Every ticket includes the haunted train ride, walk through the woods and The Omnious Sanctum (or the main haunted house). Since the lines were not too long when we arrived, we skipped the Fast Pass and chose the combo admission in order to gain access to The Pandemonium and The Omnious Sanctum. The Pandemonium and The Omnious Sanctum are two separate haunted attractions at Terror on the Fox, so I will keep the experience for both separate. It all starts with a wait outside, while large screens play artistic scenes from inside the haunts. You can hear the blow of the train and see its magnificence pulling to a screeching halt in front of you. Ghouls roam the lines and everyone boards the haunted train for a 15 minute ride around the river. While on the train, it is lights out and fog fills the cabins. This is no relaxing train ride, ghouls are after you from above and behind. If you survive the train ride, you are escorted to a brief walk through a dark woods. If you purchased both haunted attractions, you will be directed to start at The Pandemonium. The Pandemonium creates a very real panic throughout as control is not an option in this haunted attraction. A flashlight dimly provides you with security as you try to find the right way. Imagine being alone at night in a darkened hospital or penitentiary, you hear something coming from the right and with trembling hands, you shine your tiny flashlight only to discover horror is all around you! The ghouls can see you and by the time you see them, it is already too late. The attention to detail in every corner of this haunt was outstanding. We struggled to find our way out and the ghouls had us clinging to the floor in order to avoid their grasp. The Pandemonium took us on a 24 minute panic ridden attempt to escape. Another brief walk through the darkened woods took us to The Ominous Sanctum. The grandeur of the exterior of this haunt builds excitement and fear at the same time. This is truly the type of artistic construction that only true haunted experts could create. Once inside, the grandeur continues with little to no "down" time. Old favorites still remain, but pale in comparison to the additions that have been made. I consider myself a pretty "seasoned" haunt attendee, but even I struggled to grasp that some of the props were not "real". We faced a lot of hesitation and uncertainty as we slowly moved forward and either something "supernatural" happened to my clock or it literally took us almost 40 minutes to escape! The presentation of the entire haunt would have been frightening even without ghouls, but the spot on performance made for a very thrilling experience. A lot has changed at Terror on the Fox since it first began 19 years ago! The haunted train ride makes this attraction unique, but the addition of Pandemonium and expansion of the main haunt has turned this into one of the best attractions in Northeast Wisconsin. Everything, from the exterior of The Ominous Sanctum, to the ghouls rocking to heavy metal, screams that this is the work of true haunted experts! I recommend this haunt to "seasoned" attendees as it might be too frightening for anyone who can not handle fear.